A manufacturing business uses work orders whether it is generated manually or using software. When manual, pieces of paper documents are passed from one factory area to another to identify the process being performed, the end product and the quantity. If the foreman or a salesperson wants to know the status of the production, he or she has to chase around to find out where it is, what has been done so far and when it will all be ready. In the computerized model, as the paperwork travels in stages to its final destination, someone records its status. The foreman or salesperson simply checks its status using the designated software. Some items are built for stock, others for specific customer orders. Those that need a faster track to finished production status can be a dilemma to the decision maker on the method to speed up the process. Should a customer order for an item that needs to be produced automatically trigger the creation of a production work order? Or should it trigger a report that helps a factory worker decide to create the work order? If a sales order triggers an automatic work order it may cause issues related to being able to produce the item especially if raw material is allocated for previously generated work orders. If a work order is only generated when human interaction decides so, then the business is reliant on properly trained workers to make the proper decision making on a timely basis. There is also a third choice- no automatic linkage of work orders to sales orders and no manual assignment of work order. Instead, Manufacturer Resource Planning (MRP) is used to evaluate how many of an item is required for production based on commitments and prior sales along with how much raw material is available in stock. Even if MRP is performed once a week, it may still delay delivery of a customer order but it keeps workflow disciplined. Or maybe a business uses all three options depending on the situation. The decision maker at a manufacturer type business establishes the policy rules for production and relies on computer support personnel to help achieve the results that works best for them. 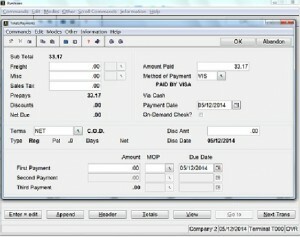 Computerized accounting systems allow one to choose the method of costing inventory. The two most common methods are FIFO (first in, first out) and LIFO (last in, first out). Most businesses utilize FIFO as it represents the truest evaluation of inventory. Every time an item is received into stock, the computer stamps the date and unit cost. It keeps track of it until the quantity received at that date stamp has been exhausted. If one receives stock of the item multiple times before it is sold or used in the manufacturing process, one will be able to see the variations on the cost of items on hand from purchase to purchase. When one sells the item, it will use the oldest time stamp to relieve from inventory and assign the cost of that purchase as the cost of sale. still in stock shows it is purchased at a cost of $3.00 each. There may be more recent purchases at $3.25 each, but the cost of goods sold for the sales transaction is $3.00 when using FIFO. Even if the cost is higher on the older dated transaction than on more recent purchases, it still uses the oldest date still in stock. On an inventory valuation report, the extended total of all dated records for an item that correspond to what is on hand is its value when using either the FIFO or LIFO method. 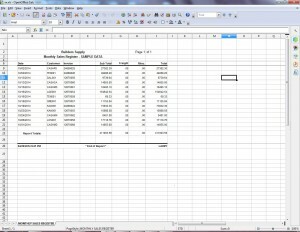 If using average cost method, the computer will grab the calculated average unit cost and extend it against the on hand to determine its valuation. This reporting method is useful when looking more at the big picture than exact numbers. LIFO is used by some businesses who determine that the recent cost of an item reflects the most reasonable value especially in times of inflationary price pressure. The IRS, however, does not allow a business to switch back and forth between LIFO and FIFO to suit their pleasure. Cash basis accounting is used by a business that generally does not stock inventory but rather provides services. Taxable income is not recognized until money has been received. Expense that reduces taxable income is not recognized until money has been paid out. 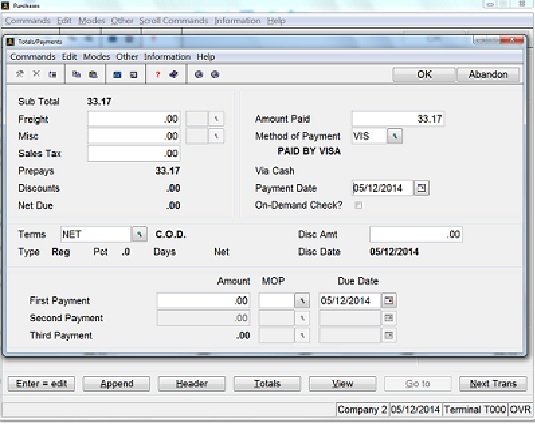 income at the point the customer invoice is generated. Why doesn’t every business just uses the cash basis method of accounting? It is because the government prefers that income be recognized sooner than later. They want the tax money as quickly as they can grab it. QuickBooks let you establish the preference for how you want to run subsidiary A/R and A/P journals as well as look at the General Ledger trial balance and Profit and Loss statements. 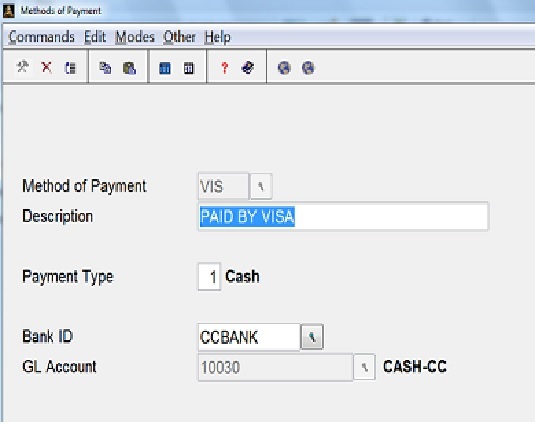 You simply tell QuickBooks you want Cash or Accrual method and it does the rest. Many more expensive accounting systems are written presuming that businesses that purchase their software have inventory and therefore need the Accrual method. Customization may be required to generate cash basis reporting. In some cases, it may mean setting up a separate company GL and have the subsidiary data flow into it on a cash basis via ancillary processing. If you run a business that is service oriented rather than turning over stock, you may still consider the accrual method. If you wait to accumulate a customer’s invoice and collect the fees rather quickly, it will be to your advantage to use the accrual method especially if you are given a full thirty days to pay your regular expenses. You are using the tax break even when you haven’t paid the piper. This new rental or monthly subscription concept has emerged due to the utilization of the “cloud” as the storage device of preference. The “cloud” is not a special place. It is just another name for web-based servers. Rather than maintain one’s sensitive business data on a local computer or server, space is rented on a remote server addressable via Internet protocol addressing. The benefit is that the cloud host is responsible for making sure access is available twenty-four hours a day. The cloud people maintain your data backup as well. Try to purchase Microsoft Office® or Intuit’s QuickBooksTM today. You are steered to an online, cloud hosted solution. For Office 365, the pricing goes from $5 to $15 a month. Extended to a full year, it can be a $60 to $180 expenditure. This may not seem like much but until a short time ago, you could buy an Office product for no more than $150 and use it forever until your computer crashed and needed a new one. With the subscription model, the moment you give it up, you lose access to the program. Microsoft has you locked in. They save money on distribution costs such as dvd’s and retail outlet stores sharing the profits. Quick Books on-line cloud model is priced from $10 to $40 a month subscription depending on how many features you need and whether it has to be multiuser capable. 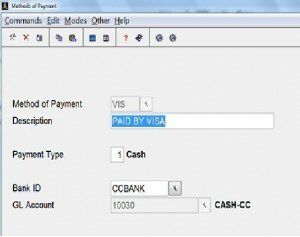 The limitation of QuickBooks is that it is not customizable. Well, maybe it is but the source code is made available only to those software consulting firms that are producing add-ons for a large base of users and not just one user’s enhancement need. The jump in pricing from QuickBooks to a more robust accounting software product can be quite dramatic. With QuickBooks you are spending less than $500 a year. Getting a more involved accounting product may cost a business from $10,000 on the low end to $200,000 on the upper reaches. The vast majority of small businesses can get away with using QuickBooks. At such a relatively low expense, they can better afford to pay for someone to help them set up their in-house accounting system and seek this outside advice when needed. The outside help more likely will not be the regular cpa as his or her hourly rate may be more expensive compared to an experienced business computer consultant. Those businesses that need the customized solution have usually already sold themselves on the emotional aspect of spending more than they would like to. This is akin to buying a new car. You know when you need one and you bite the bullet as best as possible. EOQ Economic Order Quantity presumes that there is no delay in getting the item quickly from a supplier. Typically one orders the largest quantity possible in order to get the best price reduction. The ideal quantity in such a case is the total ordered the previous 12 months. The system looks at the total sales less returns from the previous 12 months and recommends it as the EOQ. It reduces the amount by the current quantity available. MIN/MAX Measures current quantity available against minimum quantity on hand established for the item. It makes sure that it does not exceed maximum on hand. If a quantity is determined to be re-ordered, it is padded if less than the minimum order quantity. Quantity available = on hand less committed to booked orders but not yet shipped plus existing purchase on order. If there is 20 on hand, with 5 committed and 3 on order, the available is 18. If item has 10 available with a max of 30 and a min of 12, it recommends to order 2. But if the minimum order quantity is 4, it recommends to order 4. FORECAST Use a sales forecast factor (see below) to establish quantity needed to replace calculated monthly sales. This monthly sales figure is weighted against the lead time and reorder point. If an item has a lead time of 5 business days and an average monthly sale of 11, it is indicating a need between 2 to 3 a week each month. This is factored against the re-order point. The re-order point should be set to at least 2 as it takes an entire business week to get the merchandise and you need at least 2 each week. If there is more than two or more available, there is no need to re-order. If there is zero available, then 2 should be immediately re-ordered. Lead Time how many business days it takes to receive goods after ordering. Forecast Factor percentage of sales from specified range of previous months sales. For more information, call (773) 502-5771 . Recipients are lazy and don’t bother to open them Not effective for transmitting newsletters, instruction manuals, invoices, purchase orders, other multi-page etc. Attachment naysayers state that inline text with fancy HTML framing is the way to go. It gets past the default corporate level spam controllers set to filter out attachments and html is designed to attract curiosity. If you agree with this, it sounds like a slam dunk. Attachments, however, do solve a need and often are a better solution than inline text. Not everything you email has to be for the purpose of marketing a product or service or to get you to visit a website. Instruction manuals, invoices, purchase orders, newsletters, pictures, and other multiple page communiques are better served being sent as an attachment. Of course the naysayers will again argue that these are warranted to be saved on an ftp server and accessible by a link in an html formatted inline email message. Sometimes that does make sense if you are anticipating that visitors to a website page will download the document as needed. But, the originator of an invoice or purchase order needs to make sure that the document goes directly to a specific recipient in a timely manner. The same may apply to a topical newsletter or updated policy guideline or even a request to customers to fill out an updated form. Bottom line- email attachments are just as useful as fancy inline texts. In fact, sometimes recipients of html embedded inline text will be wary of clicking on the hyper link for it becomes apparent that they will be clicking to a path of response tracking. That can be as obtrusive as being asked to take a survey. With an attachment, either you decide to click and download it to your computer or ignore it. The attachment usually is labeled with a file name that identifies its purpose. Open Systems utilizes the attachment concept for email delivery of customer invoices and statements, vendor purchase orders, as well as for reports such as A/R aged trial balance, sales journal, etc. 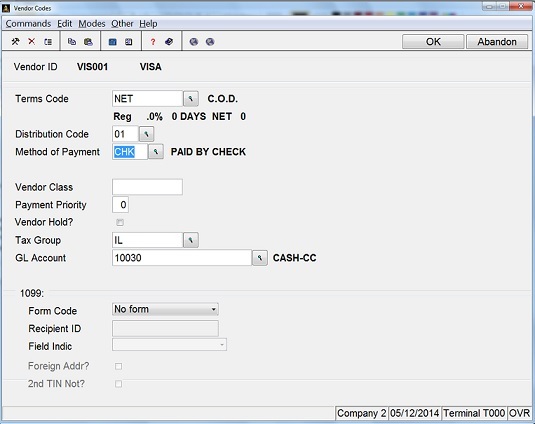 Older versions of the software gave the user the option to send a report (not a form such as invoice or statement) as inline text. However, it created formatting issues and the more recent versions now only allow for attachments. We have expanded the email capability in OSAS for users who need to send the same document to multiple recipients with our Customer Communication Add-on. 2. 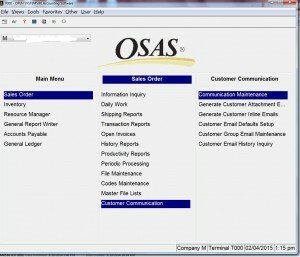 User places the document or file into the OSAS ..\document\forms folder. 3. User accesses group email routine. 4. Identifies the document or file. 5. Enters the subject line. 6. Enters the email type code. Computer displays the list of customers who will receive the file. 7. User may optionally delete customers from the list. 8. User may add inline text to body of message. 9. User processes the batch. If system is flagged to send emails immediately, they are sent. 10. If system is flagged not to send immediately, user goes to EMAIL QUEUE in Resource Manager, reviews and processes. Transmissions are captured to OSAS Email History. As part of the enhancement, a VIEW CUSTOMER EMAIL HISTORY screen is made available. Larry Teren & Associates has customized SO/AR modules to offer a receptacle to generate emails with and without attachments that are in addition to the standard invoice, quote and statement delivery. 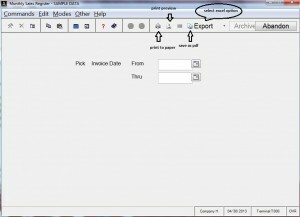 Group Email processing ideal for sending newsletters to customers. Adding Inline text to emails. and cash account isolated for credit card balances. by the credit card payments. The value will show up as a negative balance in the GL. 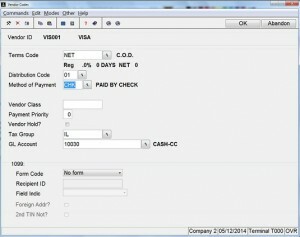 to enter an invoice for VIS001, it will make 10030 the expense account. posting or reflagged as PREPAY after posting, make sure that the MOP is VIS. 33.17 will post to the 10030 GL account. make sure that on the line item the expense account is 10030 (the Credit Card GL Account). number or print the check and the computer will assign the number. account for the original vendor invoice. Font type and size, portrait or landscape as well are programmable using the Jasper iReports toolkit. All Print Previews may be saved as a pdf. 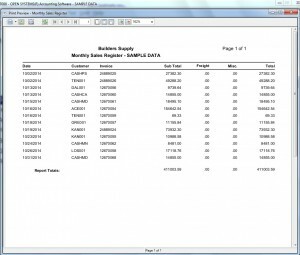 Here is an example of the same report output to Microsoft Excel. A computer consultant is someone who advises a client on their computer system for the best way to get the most out of the software. A consultant at times has to be a business analyst. A consultant is told of a request or problem. He (or she) is then obliged to come up with one or more solutions and offer them to the client. The client may or may not accept the solutions. But, from the advice given by the consultant, the client is better informed so that they can either accept a solution or devise their own. A good consultant should be one who can then follow through and enact the solution. Advice is cheap. A client doesn’t need to just get advice. It may be that the consultant is capable of solving the problem or following through on a new request. Sometimes the consultant will not be able to roll up the sleeves and do the work but will know how to communicate the need to someone else who can. This is important as well. Our expertise is such that when it comes to accounting systems, we understand the situation and are more often able to provide a solution. If something is broke, we fix it. If the client wants to understand how an inventory item posted a certain cost to the general ledger, we are usually able to do the forensics and figure out what took place. We understand how to do the research. If a customer asks how they can export information in a different way into Microsoft Excel or extract selected data based on special selection criteria, we know how to get the results that is wanted. If a customer needs to have one software product interact with another, we know how to cut through the red tape and get the answers that will tell if it can be done or not. In short, the computer consultant facilitates the efficient usage of a computer system. Author Larry TerenPosted on August 31, 2012 May 13, 2015 Categories UncategorizedLeave a comment on What Is a Computer Consultant?